Pale Gray labs specializes in creating stitchwork that is beyond the capacity of human beings; designs that can only be executed by robot. … Our speciality is the application of sophisticated mathematical techniques to the creation of single-line stitching instructions, starting from vector art (Adobe Illustrator, EPS, etc). Minting money on the quilting machine, named Behemoth. Ironically (for ironic juxtaposition!) quilts are among among the most under-valued art forms. They also require more skill and time than almost any other art-making technique I’ve tried. The selling price of quilts seldom covers the costs of materials; quilters often prefer to give their quilts away. An “expensive” quilt usually costs more than the value of materials, but less than minimum wage for labor. 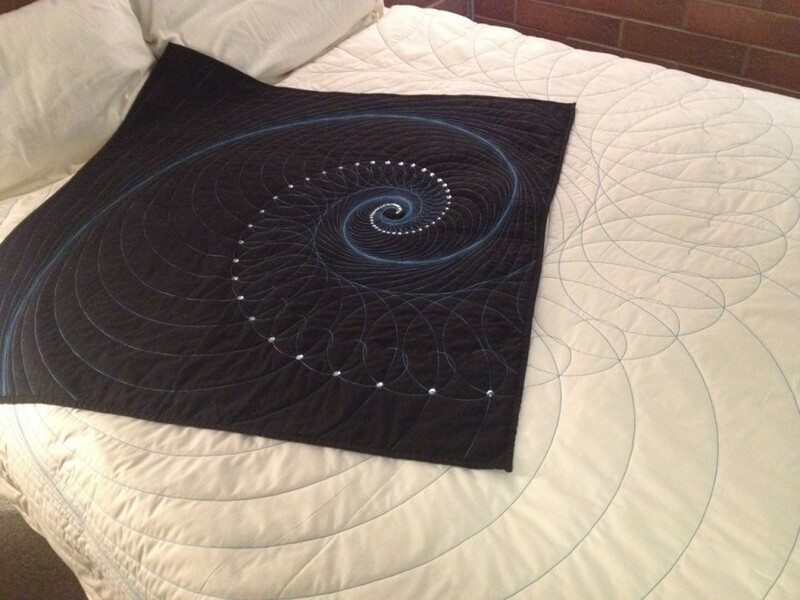 I recently met a master quilter whose beautiful wall quilt, which took months of expert work and won many awards, was professionally appraised at $3,500. This is considered very high; had it not been widely displayed and won many awards, it would be “worth” far less. Can’t wait to see what Nina and Theo will create next! In the meantime, check out the PaleGray site to see all the collaborations, take a closer look at those gorgeous Thousand Dollar Quilts, and peruse Nina’s blog for more of the stories and photos behind these unique creations. PaleGray’s first-ever design for a quilting machine.